A critique of "The Lives of Sri Aurobindo" by Peter Heehs and its consequences in the Ashram life: DattaGate: Exposing the Corrupt Trustees of the Ashram! DattaGate: Exposing the Corrupt Trustees of the Ashram! Dilip Datta’s latest deal is the most novel so far and suggests how skilfully the Ashram finances and properties are being diverted and subverted by the Trustees. On the face of it there are two apparently unconnected events: 1) Ratnadeep Datta and his wife bought another plush house in Pondicherry, and 2) an Ashramite was assigned a new house in the Ashram. Nothing strange apparently until you realise that the Ashramite was the same person who sold the house to Ratnadeep Datta and his wife Jyotsna and that the sale of the house was at a price far below its market value. Now the skeletons come tumbling out! On 13.13.1974 one Michèle Mercier, a French citizen living in the Ashram, purchased a plot of land of 1800 sq.ft. and later built a large three storeyed building named “Abhiseka” situated at 9, Padmini Thottam, Kuruchikuppam, Puducherry 605012. She lived there all of these years even after she was formally admitted into the Ashram as a permanent Inmate. It is a large house, more than sufficient for an entire family to live in, and certainly more than enough for one person. But having no income, and with maintenance costs increasing, she found the house too big to manage. In 2009, she approached the Ashram Trustees with the offer to donate the building to the Ashram in exchange for a smaller house closer to the Ashram main building. Instead Dilip Datta allegedly made a counter offer: she could sell the land to his son for a low price, and keep the money while still getting herself premium accommodation assigned from the Ashram! She readily agreed. Dr Dilip Datta, head of the Ashram’s medical section, told her that Huta D Hindocha (the Mother’s confidante) was quite ill and would not survive much longer, and promised to assign Michèle her house as soon as she passed away. Finally, in early October 2011, under pressure of other doctors of the Ashram, Huta agreed to shift to the Ashram Nursing Home. Once more in the care of “Dr Death”, she did not return alive. Even while Huta was receiving treatment in the Nursing Home, Dilip Datta gave the go ahead to his son for purchase of Michèle’s house. But Michèle Mercier had been disappointed too often. She wanted some guarantee for her interests to be protected. What if, she asked, Huta did not die now? What if, after completing the sale, she was not given the house that she wanted? Dilip Datta agreed that she could sell half the house to begin with and transfer the other half after shifting to her Ashram assigned premium accommodation. On 17th November 2011, Huta D Hindocha passed away in the Ashram Nursing Home. According to her Will, her body was brought back to her house and kept on her bed, surrounded by the Mother’s Treasures and her life’s work done under the Mother’s guidance. Dilip Datta and Ratnadeep Datta were not among those who came to see her off. The question has often been asked: why are the present Trustees of the Ashram so keen to protect and promote corruption in the Ashram affairs? The answer is simple: because the Trustees are part of the corruption and derive personal benefits! But, people ask, what do they need money for? What would they do with the crores that they have allegedly siphoned off from the Ashram’s finances? In this article we explore one of the many novel ways in which Dilip Datta, Trustee of the Ashram, has been siphoning Ashram funds to benefit his immediate family members. The Ashram Trust holds vast properties in Pondicherry, and since the Trustees keep all Ashram affairs hidden from the Ashram resident Inmates, they can get away with surreptitious sales of the Ashram’s lands and properties. There have been many land scams in the last 15 years in which the Trustees sold off Ashram lands purchased by Sri Aurobindo and the Mother (or received by them as gifts) for the Ashram’s needs and future security. Each time Ashram land is sold off over 50% of the sale price is alleged to be received by the Trustees in cash and used for their personal benefits. The Ashram resident Inmates and devotees do not know that land has been sold until the deed is irreversibly done, and then also only by word of mouth. They watch helplessly as the Trustees are breaking up all that the Mother and Sri Aurobindo worked to build, and as the future security of the community is rapidly eroded. But because the Trustees are now under the scanner of the Government having started a legal battle with the Government of Puducherry with regard to their corrupt practices, they are more careful, less blatant in their corruption. But the sale of Ashram land and property continues unabated, but now in increasingly novel forms of corruption. DattaGate is a case in point. Read on. Dr Dilip Datta was practising medicine in Assam where he had developed the dubious reputation of “Dr Death” for the large numbers of deaths from medical negligence under his watch. Eventually the law caught up with him and he was charged with criminal cases of medical negligence with arrest and imprisonment allegedly imminent. His reputation shattered, he sought out new lands where he could live anonymously in comfort and his children would get a free and secure education. It was thus that he came to settle in the Sri Aurobindo Ashram in the early 1980s, and his children received free education in the Ashram school. He kept a low profile and ingratiated himself to Manoj Das Gupta over the years having identified him as a growing power centre. Eventually he received the reward for his personal loyalty by being nominated as Trustee of the Ashram in a closed door session of the Trust Board. The meteoric rise of his family fortunes began from that point – from a lower middle class family without finances his family today allegedly owns under various names, large properties in Pondicherry and Chennai worth in excess of Rs 20 crores. Earlier Dilip Datta was limiting use of his influence as a doctor in the Ashram to only help his children get jobs. His daughter and elder son had thus found themselves convenient jobs abroad. But as a Trustee, Dilip Datta began to use the influence of the Ashram Trust Board to seek special favours for his entire family. As the benefits accrued, he sought more. Meanwhile his younger son, Ratnadeep Datta, who had joined the Indian Army and was doing well, was asked abruptly to leave his natural calling. Dilip Datta allegedly pulled strings through the Ashram’s connections and managed to get his son discharged from the Army on health and other specious grounds. Ratnadeep took up employment in a private business in Pondicherry and along with his wife and her extended family became the front for Dilip Datta’s shady dealings. But Dilip Datta’s latest deal is the most novel so far and suggests how skilfully the Ashram finances and properties are being diverted and subverted by the Trustees. On the face of it there are two apparently unconnected events: 1) Ratnadeep Datta and his wife bought another plush house in Pondicherry, and 2) an Ashramite was assigned a new house in the Ashram. Nothing strange apparently until you realise that the Ashramite was the same person who sold the house to Ratnadeep Datta and his wife Jyotsna and that the sale of the house was at a price far below its market value. Now the skeletons come tumbling out! So what is wrong with the sale deed by which Dilip Datta’s family has purchased Michèle’s house? Plenty! This deed of sale does things no one in her right mind would accept – it binds Michèle to complete loss of privacy and loss of control of her entire house even while selling only half of it. It prevents her from selling the other half of her house to anyone else except Dilip Datta’s family members. It allows Ratnadeep Datta to own the entire house for good while only paying for half of it and that too at a price well below market rates! Strange, wouldn’t you say? The market value for the house is about 1.5 crore Rupees. But Ratnadeep Datta has purchased half the property for only Rs 35 lakhs, a throwaway price by market standards! Ratnadeep Datta promises to buy the other half of the house after 3 years, in return for which Michèle Mercier immediately gives him entire possession of her house. But the property will be worth much more by the time 3 years are over, so how much will Ratnadeep have to pay by October 2014? The Sale Deed is completely silent on this! This is unheard of in any transaction. Have you ever heard of a sale in which half the property is sold with a promise to buy the other half in 3 years without specifying the remaining payment? For the buyer it amounts to exposing himself to blackmail as the seller can then demand any price on a whim! So why did Ratnadeep agree to such a dangerous purchase? Because the sale is for an “undivided half” of the house. That means there is no boundary line which separates Michèle’s personal space from Dilip Datta’s family space. In other words Dilip Datta’s family can walk into any part of Michèle’s house and demand that she share the space with them. Because of this one detail, it is the seller, Michèle Mercier who is exposing herself to risk of blackmail by Dilip Datta’s family! Worse still. Since Ratnadeep owns an undivided half of the house, no one else can buy the other half from Michèle without getting into serious conflict with Datta’s family. In other words only a member of Dilip Datta’s family can or will buy the other undivided half of the house! In fact if Ratnadeep refuses to buy the other half within three years, Michèle has no option except to wait until Datta’s family decides to buy, at whatever price they choose to buy at. And if they offer far less than Rs 35 lakhs, or even nothing at all for the other half, she will be forced to accept. In fact a local lawyer suggests that this is a device by which Ratnadeep Datta will end up buying the entire house without paying anything more and evade the high stamp duty that the full payment would entail, and also evade the high income tax and property tax that it would involve. By all normal standards, this would be treated as an illegal transaction and could land both sides in jail. So why would Michèle Mercier submit herself to such a dangerous arrangement? Precisely because she has been promised a complete new house for free by Dilip Datta in his capacity as Trustee of the Sri Aurobindo Ashram Trust. The transfer of her house to Datta’s family is left incomplete until she is given her new house by the Ashram Trust at which point she will sign off the other half of her old house to Datta’s family! Even if she does not get the amount due to her from Datta’s family (at whatever price – revised or unrevised) she would still be the sole occupant of a plush independent house exclusively designed and decorated for her by the Ashram’s construction department, and she would be living in a property which is worth far more than the house she has sold off. In either case, at whatever price, and whether the final transaction is completed or not, Michèle still keeps her free cash of Rs 35 lakhs while getting a large house of higher value fully furnished and decorated to her tastes and instructions! In other words, Michèle Mercier remains the winner all along in this risky-looking arrangement. So who loses? If Dilip Datta’s family gains property worth 1.5 crores for a mere 35 lakhs, and if Michèle gets a new redecorated house worth much more along with excess cash for free, then someone has to lose along the way right? Who is the loser here? You guessed right: it is the Sri Aurobindo Ashram which loses everything! It is the Ashram which ends up paying Michèle Rs 35 lakhs while giving her free premium accommodation. Or, looking at the situation another way, it is the Ashram which ends up gifting away a Rs 1.5 crores 3-storey house to Dilip Datta’s family. Whichever way you look at it, Dilip Datta as Trustee of the Sri Aurobindo Ashram Trust has stolen a large premium house from the Ashram and given it away to his son for free! It is the Ashram which is the loser all the way and in every way, and it is Dilip Datta as Trustee who is directly responsible for causing enormous loss to the Ashram as an institution. It is alleged by land brokers of Pondicherry that Dilip Datta’s family members have bought properties worth twenty crores in Pondicherry and Chennai. From where have they got so much money? The eldest son, Sanjeev Datta, did not even have a decent job for the last five years. Vinay Sharan (Dilip Datta’s son-in-law) was unemployed until recently when Dilip Datta used the Ashram Trust’s “recommendation” to get him a job in France in the company owned by the husband of Devasmita (sister of Peter Heehs’ girlfriend). Ratnadeep Datta is the only one who has a regular job in an IT firm, but his current income is very far from enabling his family to buy so much real estate in Puducherry. So, from where has all the big money come from? The local grapevine says that these unlimited funds come from the offerings of the millions of devotees of Sri Aurobindo and the Mother from all over India and the world sent to the Ashram Trust. A substantial part of these offerings is converted by the Trustees into unaccounted cash and is invested through their proxies. Check the assets of these people, inquire into the source of their funds and many more skeletons will come tumbling out of the cupboards of the DisGrace Office of the Ashram Trustees. This cosy arrangement between the Trustees and their relatives is designed to cheat the Ashram and steal Mother’s property to hand it over to private family and business interests, to the detriment of the Mother’s work and the reason for which She created the Ashram. And this is just one of several equally painful cases of serious theft by the present Trustees in the last decade. Michèle already had a large house to herself, so the Ashram does not need to provide housing for her. If at all she wanted a smaller house, closer to the Ashram, she could have transferred her house to the Ashram for the Mother’s use and for other Ashram Inmates to live in while she was shifted elsewhere. The Ashram would have benefitted all the way. In fact, in the early days of the Ashram it was the norm that whoever joined the Ashram as disciple of Sri Aurobindo would give everything that they owned to the Guru, Sri Aurobindo and the Mother. Nothing was left that was one’s own. Today, when the present Trustees have replaced the Mother’s rule by the Trustees’ personal ego-rule, this norm has been perverted so that people sell off their property for personal benefit and then further demand that the Ashram give them extra benefits! Or, they give side benefits (a.k.a. “kickbacks”) to the Trustees in order to gain from the Ashram’s resources. This is only possible because the present Trustees do not care for the Mother and Sri Aurobindo, and use them merely as figureheads to get donations which they can loot and divert to their family and business interests. This is the root cause of why the Trustees continue to support and promote to Peter Heehs in his abuse of Sri Aurobindo. The right thing for all those who love the Mother and Sri Aurobindo is to refocus their loyalty upon the Mother and refuse to serve the perverse whims and fancies of these corrupt Trustees, and instead demand that these Trustees step down before they bring the Ashram to ruin. It is our responsibility to protect the Ashram’s interests in Service of the Mother, and not to serve the Trustees’ perverse interests. And what of the house that was prepared for Huta and for the Mother’s work? What is happenning to the Mother’s Treasures which Huta was curating, organising and publishing? It is alleged that the Trustees have ordered all her things to be taken away. Manoj Das Gupta, the Managing Trustee, reportedly said “Huta was troubling the Mother” and hence he has no interest in preserving the paintings and correspondence of Huta with the Mother! A perverted mind can never know the value of the Mother’s work with Huta. It was the Mother who trained Huta over 18 years for the Savitri and other painting series which Mother said were Her paintings executed through Huta’s hands. In each case, the Mother led Huta into the direct spiritual experiences embodied and expressed in these paintings. All of this is documented in the Mother’s rich, diverse and detailed correspondence with Huta. And then there are all the objects that the Mother used which she gave to Huta with specific instructions. All of these things and more comprise “Mother’s Treasures” that Huta was publishing and curating as part of the work given to her by the Mother. Mother’s work still continues in Huta’s house, but now under grave threat of harm from the Trustees’ business interests. Dilip Datta’s personal gain is Mother’s loss. It is for us to choose if we will stand up for the Mother’s Work, or if we will sit quietly and let the Trustees continue their crimes and allow them to destroy Mother’s Work. Attached is a copy of the first few pages of the sale deed of the Datta family transaction with Michèle Mercier providing incontrovertible evidence of Dilip Datta’s latest crime. 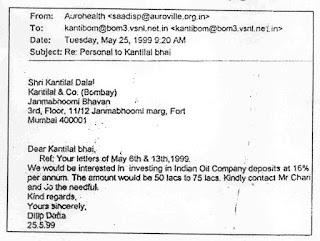 Also attached is a copy of his personal email dated May 25, 1999 as published in a Tamil newspaper. Above: First few pages of Sale Deed of Dilip Datta’s family purchase. 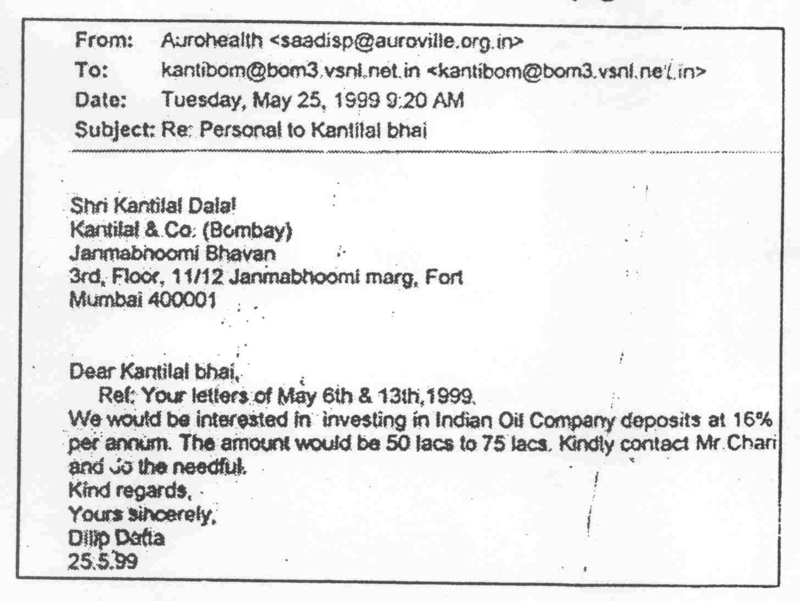 Above: Personal letter of Dilip Datta’s investment offer. The details of the land and real estate squabbling will shock any right thinking person-more so if it happens at a spiritual centre and worse still- if the dramatis personae happen to be the powers that hold the reins. A trustee needs to uphold the trust of the sadhaks, in the light of the life and work of the Masters who give them the sustenance- material and spiritual. If the proverbial norm of caesar or his wife are not above the needle of suspicion, then the consequences are likely to be catastrophic. One cannot but remind those who sully the image of the Ashram by such conduct - the Decree of the Master in 'The Hour of God'::"In the hour of God cleanse thy soul of all self-deceit and hypocracy and vain self-flattering that thou may look straight into thy spirit and hear that which summons it. All insincerity of nature, once thy defence against the eye of the Master and the light of the ideal, becomes now a gap in thy armour and invites the blow.Even if thou conquer for the moment, it is worse for thee, for the blow shall come afterwards and cast thee down in the midst of thy triumph." Do the people who are given to misusing the position of trust given to them by the silent majority, ever wake up, before "the hour of the unexpected"? The majority of spiritual seekers would pray for better and saner sense to prevail, before it is too late. I would not be surprised if there is a similar fishy deal with Peter Heehs with the Ashram Trust because of which he gets such unstinting support from Manoj Das Gupta. There was already at one point of time a leaked email of Heehs about "Money Matters" going about on the Net. All this talk of neutrality and freedom of speech would be then merely a cover-up for a secret transfer of cash! There should be a thorough investigation of all foreign contributions to the Trust.